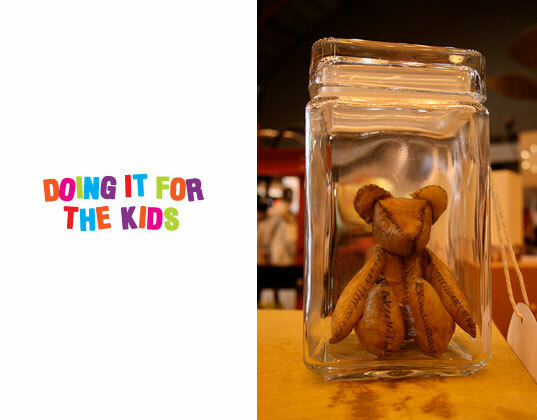 Doing it for the Kids is a current exhibition put on by [re] design to showcase the latest, most innovative sustainable toy designs from around the globe. Among them, the Placenta Teddy Bear by designer Alex Green. A crafty alternative for those who don’t necessarily want to eat their baby’s placenta, but want to pay their respects to the life sustaining organ by turning it into a one-of-a-kind teddy bear. Green’s ‘Twin Teddy Kit’ ‘celebrates the unity of the infant, the mother and the placenta,’ and enables preparation of the placenta so it may be transformed into a teddy bear. The placenta must be cut in half and rubbed with sea salt to cure it. After it is dried out, it is treated with an emulsifying mixture of tannin and egg yolk to make it soft and pliable. Then, you craft it into a teddy bear. But is this not quite so cuddly creation cute or cringe-worthy? You tell us. Contained in a glass jar, the Placenta Teddy Bear isn’t made for cuddling, but it makes quite a keepsake. Doing it for the Kids recently unveiled many additional fascinating, inventive ‘toys’ at the 100% Design Exhibition in London. The goal of the exhibition is to inspire designers, educators and parents to be more critical of the toys that shape a child’s values and the impact toy making has on the environment. That is seriously f***ed up. Definitely on the "eewww!" side for me. I could see eating a placenta after giving birth, I could see encapsulating it, and I could see burying it somewhere special (though I'd consider that the least useful disposition of the choices). This is just a little too weird for me, LOL! This is right out of the "Shadow Man" video game. Shadow Man was dark, creepy, very creative in the story, art and music. But at the same time, disturbing, depressing. Thumbs up for creativity, but somebody was whacked when they interpreted "sustainable toy designs", so double thumbs down and a downvote. It's as if Hannibal Lecter and FAO Scwartz got together to make a toy. Less gross then wearing animal hide. I see nothing wrong with it. I ate mine, but that isnt everybodies cuppa. I have the cord in the freezer, am yet to find a use. Maybe a necklace? I don't get it. I wouldn't mind seeing what the afterbirth looks like, but nothing further than that. Should we be saving/reusing our toenail clippings too? Sitting in delivery room, fresh after childbirth: "Look Honey, its your placenta." "Yeah, Bob...whatever shall we do with it?" "I dunno dear, surely we can think of something, Hey, I know, what about a placenta teddy bear." "Great idea Bob, I'll dry it out, put on special oils and seasonings, create a pattern and hand stitch it all together." "And to think, we have been eating it all these years. Now we have a toy for our child to cherish, forever and ever." " I love you Bob, you're the best. What me to save the scraps for stew tomorrow?" It's grotesque. The awful colour, the awful stitching, the awful shape. It's done with deliberate intent to repulse the audience and then to sit back and say "wha? You wear leather, don't you?" Ridiculous and vile. "It rubs the sea salt on its skin or it gets the hose again!" Sorry, did someone just say 'I ate mine'? Bleurgh. Transforming the placenta in capsules for consumption after birth has many benefits; reducing chances of baby blues and post-natal depression, encourages a healthy milk supply and gives new mum a helpful supplement of essential fats, minerals and vitamins tailored for her own body. I find it hard to see the benefits of a placenta teddy but keen to speak to the person who invented this unusual tradition. Makes me chuckle. I wonder if they get any clients. Koala Therapies.com for info on placenta encapsulation in the UK. I'm all for freedom of expression and art, and creativity... but that goes beyond the acceptable, to me. Something I wouldn't even expect to find in a place like the Mutter Museum. I simply cannot believe someone actually created this (and for that statement, I apologize to the crafter, but it's just my opinion) - it's almost reminiscent of people who made things out of human skins during the war... or mementos serial killers in movies keep of their victims... like that container of eyelids from Haunting in Connecticut. I seriously cannot believe someone did this! It just seems *wrong*, on so many levels. Though, I'll admit, I can't see eating it either. That's almost like someone drinking their own menstrual blood or something, in my mind! ummmm... yeah, I have examined myself and have decided that I still find it revolting ;) Yes - humans are disconnected somewhat from nature - we no longer defecate in the woods on a daily basis (well, I hope not! ), we bathe with soap, brush our teeth with toothbrushes, aim to eliminate body odor; we don't roll around in animal excrement or urine (well, ha! I suppose some hunters do LOL)... some things are no longer necessary for us to live. Like eating placenta. Or making teddy bears out of it. My wife is a placenta artist and preserves them in creative ways. There's a market and some people like to have this reminder of birth memorialized. I think it is very strange that most of the commenters here find this 'vile' and 'repulsive' - but my guess is that most have no problem eating dead animal carcasses or wearing the skin of a dead animal as clothing (leather, fur). How is this any different than leather - except that no cruelty was involved? At least with this placenta teddy bear the placenta has naturally ceased serving its essential purpose, and comes from your own body rather than that of an animal that was killed for it's skin or flesh. You people need to seriously take a step back and think about the LOGIC of what you are saying. Anne- I'm a vegan and I see nothing distasteful about this, as it comes from the human body and ia a byproduct of birth. Most mammals eat their own placentas, and most cultures around the world do SOMETHING with it (bury it, burn it, eat it etc). Why not make a Teddy Bear out of it? burying the placenta in the soil & planting a flower/tree on it is a great way to celebrate the baby's birth.. placenta teddy bear is NOT. I love this so much it's worrying. What better use for your afterbirth than a cuddly toy? Total 'facts of life conversation' ice-breaker too! Imagine millions of years from now, archeologists would dig this salted and cured bad boy up and wonder what on earth we were doing with a children's toy made of placenta. I'd like to see them explain that one. Bizarre! Ewwwwww! Eating your placenta? Making a Teddy Bear out of it? Both ideas are sick, man. Anyone who thinks otherwise has got to be kidding. This is the most twisted thing I have ever heard of!! I'm all for living naturally but WTF!! You do not eat your Placenta unless you are stranded on a desert Island and you certainly NEVER make Teddies out of it. Teddies!?!?! You sound like you have fallen off your rocker a few too many times. An NO THERE IS NO MARKET for crafts made from placentas. Should we keep our foreskins and make yoyos from them! Or maybe we should turn them into gum drops! Eating Placentas!! Have you never heard of CJD? Mad Cow for Humans?!?! Cannibalism has been implicated as a transmission mechanism for abnormal prions that cause CJD. Anyone that says this is ok or eats their placenta needs some serious professional help. Is Michaels and other arts and craft stores going to sell 'Make it yourself Placenta Teddy Bears'? I think that's a HELL NO. Hey Momof3 Good leg work however not complete. I was being a little general. Kuru which is very closely related to CJD (more commonly referenced) is transferable by ingesting human tissue/blood. It was first documented in the Fore tribe of Papua New Geinea which practiced a ritualistic form of cannibalism to celebrate the death of a family member. They didn't farm cattle or any other livestock. After further study it was discovered that many tribe members pretended to participate. Many of those that did participate later developed Kuru. It was only after death that some protiens change (prions) in the brain and when ingested caused the Kuru. So yes. Ingesting human tissue or coming in contact with these prions when cut could lead to developing Kure which is commonly refered to as Mad Cow in humans or sometimes CJD. Don't eat people. I think this is truly bizarre and frankly a little disturbing! Now I know what I am getting all of my friends when their babies are born! I can't stop laughing over this article! I read it to my husband and I swear his face turned green! This is so, so, SO gross on so many levels... there is nothing comforting about a hairless, leathery placenta teddy bear. Yes, I eat meat- absolutely. I still find this repulsive. I don't take animal organs and make toys out of them (and no, we are not sports fans, btw). That being said, I would NEVER eat a placenta either. I didn't even want to LOOK at it. Awesome- it was your baby's "life force". It has outlived its purpose as soon as that baby is born. I would rather celebrate my baby than the placenta that "nurtured" it. Give me a break. Sorry, still laughing! Makes me glad I'm a grandma and never will be approached with such an idea....did my X husband suggest this??? LOL!!! You have succeeded in making me feel ill.... that is the most disgusting idea.... so a BIG no no from me! My placenta was buried and a tree planted over it. I don't know if that tree is still standing, we've had a lot of hurricanes destroy trees across the island during these 39 years. I have heard of people eating the placenta and the first time I heard that I almost vomited, I was so grossed out. They even said it tasted like liver. One step towards cannibalism, the thought of someone eating placenta still grosses me out and now this ugly looking toy bear OMG WOW. I am at a loss. It makes me think of the movie Jeepers Creepers. Ugh gross. makes me sick kinda but I think if my momo showed me "look honey I made a teddy bear of of the thing that made us one person at one point in time. You know the placenta the part that sustained your life." I would probably be ok if it were mine I was looking at. I kept my childrens belly buttons after they fell off. I thought EWWW to but as I lifted the lid off the trash my dad said that is the last peice of your sons and your skin shared. I put it in his Baby book never to be seen again. But will ask him when he is old enough if he wants to see it. If not I am throwing it away. Why in gods name would anybody put that thing in your house?? Art will never have boundaries. That's the whole point of art! If you set up boundaries for art, it will no longer be art... it will be deformed into something else. Even the idea of a placenta teddy bear is ironic and juxtaposed, which I think many more people should appreciate. It's not that anyone wants to take away from any artistic view whoever made this might have been trying to put across. I think it's more of it's hard to understand why anyone would want to have or even entertain the idea of a placenta teddy bear. It's disgusting and a little twisted. I get it. Art. But if you are seriously wanting to do something like this because you want to remember your babies birthday just remember, you don't need to stare at a placenta teddy bear to remember that you love your child and said child is the greatest thing that has ever happened to you. Just look at your child. I celebrated my babies birth by having a party, not by doing weird shiz with the placenta. That bear looks like something out of a horror film. The whole celebrating the placenta thing is weird. I know a girl who had hers made into pills that she took, and they made her so sick she landed herself in hospital for weeks. It's so gross. If someone has a heart transplant, do you see them sauteing up their old heart to have for dinner, or making a doll out of it to celebrate the fact that it sustained their life? Maybe the mom made this, or the grandma, sister, aunt or somebody who really cared about the mother and child. One does not take this much care of something that was a part of the mother child bond and then ignore the child and try to buy happiness for it with plastic toys. This teddy bear is telling me that this child will be cherished and listened too and not made to follow a keep up with the Jones's path. One can not catch CJC from oneself. The artist no doubt was familiar with the practice of saving the "belly button" and putting it in a special "packet". Burying it under a tree is good and spiritual. I was shocked the first time I heard of that. Eating is probably a more practical use of resources. I do not think I know anyone who has done that but maybe they don't broadcast it. Or I just need to know cooler people. Mine are probably in a toxic waste bag in a landfill. I can't think of anything grosser than that. It certainly seems a sin. When I asked after them they looked at me like I was strange. A tree would of freaked them out. Eating they would of commited me. A teddy bear they would of thought I was delusional. As a mom, if my child asks where their placenta teddy bear is and I have to tell them I did not care enough to even save it? So I applaude the teddy bear if only so some mom who wants to eat hers is told, "At least you are not making a teddy bear out of it." And the mom who wants to plant hers is told, "At least you are not eating yours." Should we save our toenails? In France there is a whole underground cave decorated with a zillion human bones. Very artistic. Comparatively a plencta teddy bear is not even in the same league with this national treasure. And what if this teddy bear was made for a mom who's baby was born not alive? The mom might treasure it. Roosevelt would be proud not prejudiced. "Honey, mommy doesn't care about your well being. She only cares that she got pregnant too early and now needs to find a personality as an adult that she never developed because she was too busy having you. I know you'll love your placenta teddy as much as mommy enjoyed feeling eccentric and weird ordering it for you." im sorry but this is disgusting. when i saw the picture i immediately thought... ed gein.... yikes and eating it? ewwwww wth!! I am a childbirth educator, birth doula and I also encapsulate placentas for women who understand and want this service. As someone else mentioned, the placenta helps prevent/decrease post partum depression, increases breast milk, and boosts maternal iron levels. Women in cultures all over the world consume their placenta. Yes, I am vegan and have no problem with this. It's interesting to me that many people who eat organ meats from other animals find taking placenta capsules disgusting. When my midwife asked me if I wanted to see the placenta (homebirth) I said sure. Then she asked what I wanted to do with it I said double bag it and throw Irvin the trash! I don't want the cat to eat it! Lol Never even crossed my mind that I could have made a Teddy bear out of it! Yeah.. I have the birth memorialized too. I have a baby to show for it. I've never even heard of eating a placenta or making decorations from it. From what I saw after having 4 kids and witnessing a nephew and granddaughter being born, the placenta is a slimy, bloody mess. I could never eat that.. Ah, but to each their own! I'm not sure what to think.. I had no interest in doing anything to mine! I got my babies, my pictures ... videos for memories. but I want to make one correction : I used to raise sheep and cows... they do NOT eat anything, livestock only eat hay, and grains... and if it's moldy or bad at all they wont touch it! ! God gave them the instinct to eat their placenta for many reasons. First and most important! It's full of nutrients... The milk they are making for their babies is most important in the first few days. It's essential for them to eat it.. We as humans can take vitamins and other supplements to meet our needs... animals, not so much! Animals do it without thinking about it cause it's like I said an instinct.. just like pushing out the baby and licking it off, to stimulate warmth and movement. Also, if it was left to lay in their pasture it would rot and drew flies. etc.. it's party their way of staying clean. Dogs, and other animals have to lick off their butts and blood too.. so why not eat the placenta too. So people that encapsulate their placentas are doing it for the nutritional reasons alone, especially if they are going to breast feed. At least be open minded about things you are not familiar with. I ate my placenta. This is too gross for me. This doesnt look weird to me - kind of like rawhide, I couldnt see myself wanting to make one of my own or anything, but it's not terrible. The thought of eating one grosses me out, as does the thought of just handling it. The capsules wouldnt be so bad cuz you dont really see it or taste it, but even that would take some nerves. Doing it for the Kids is a current exhibition put on by [re] design to showcase the latest, most innovative sustainable toy designs from around the globe. Among them, the Placenta Teddy Bear by designer Alex Green. 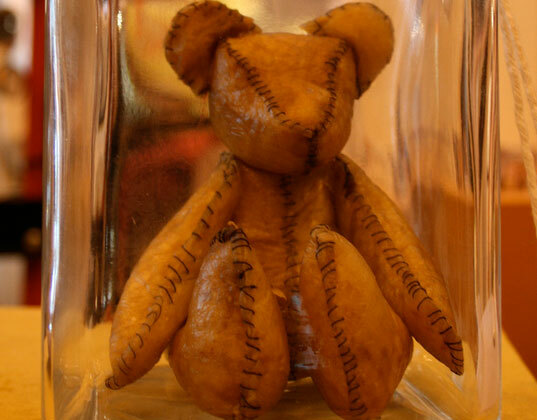 A crafty alternative for those who don't necessarily want to eat their baby's placenta, but want to pay their respects to the life sustaining organ by turning it into a one-of-a-kind teddy bear. Green's 'Twin Teddy Kit' 'celebrates the unity of the infant, the mother and the placenta,' and enables preparation of the placenta so it may be transformed into a teddy bear. The placenta must be cut in half and rubbed with sea salt to cure it. After it is dried out, it is treated with an emulsifying mixture of tannin and egg yolk to make it soft and pliable. Then, you craft it into a teddy bear. But is this not quite so cuddly creation cute or cringe-worthy? You tell us.